New new potato recipes | WTF Do I Eat Tonight? Sometimes you can mess too much with a good thing. I love new potatoes. Whether served hot, cold, steamed, boiled, fried or baked, in a salad or on their own, I find their taste both fresh and soothing and, like asparagus, cheering heralds of a change in season. This week I thought I’d try a couple of new recipes for them and, although they are interesting, I think this is one vegetable that is as delicious naked and simple as it is dressed up and complex. I tried them baked in sea salt, roasted with lemon wedges and in a new salad. The salad, with a cream cheese dressing, was the winner; the others were good but not good enough. First, I cooked 500g of potatoes in about the same amount of sea salt, flavoured with some sprigs of rosemary, in an ovenproof dish at 180°C/160°C fan/gas 4 for about 40 minutes. Baking in salt is a method known for keeping moisture and taste in and, apparently, this is how they cook them in the Canary Islands. 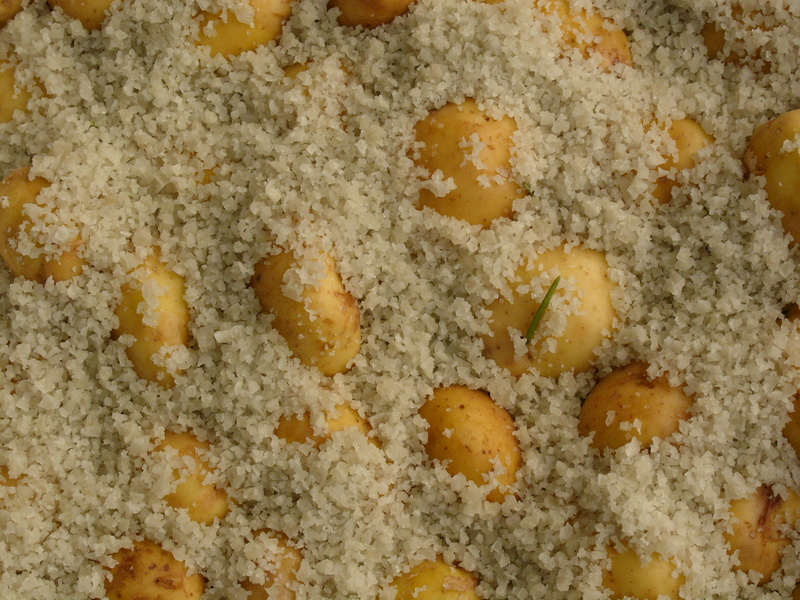 It looks great (see below) but, unlike larger things baked in whole salt (like salmon or chicken) it’s quite difficult to get the small potatoes out of the salt once cooked so they end up too salty. You can use the salt again, thank goodness, because otherwise it would be a criminal waste of 500g of the stuff. Then I roasted 500g new potatoes in olive oil with lemon wedges (2 lemons cut up), chopped garlic, fresh oregano (a handful), a variation on a recipe in River Cafe Easy. It’s quick (shove everything together really, squeezing the juice out of the lemons onto the potatoes but including the shells too, pour over plenty of olive oil, roast for about 30 minutes at 220°C/200°C fan/gas 7) and tasty but I didn’t feel, as I have this week with the spinach tian and chilli jam, that I’d make it again. I was a bit potato-d out by this point so my efforts at a new salad were a little half-hearted. In my heap of cuttings, I have a recipe for a watercress soup with potato salad as a garnish. I think it was Gordon Ramsay‘s and, no, I’m not going to suggest that salad and soup in the same bowl is something to repeat. Not in my lifetime anyway. But he made his salad dressing with mascarpone which intrigued me since my default option for potato salad has always been mayonnaise thinned with natural yogurt. I didn’t have any mascarpone but I did have some other cream cheese and, combined with some fromage frais and fresh basil, it makes a really summery and fresh salad without the stickiness of mayo. 1. Wash or scrub (as you prefer) the whole potatoes, then boil or steam them until done (usually about ten minutes). 2. 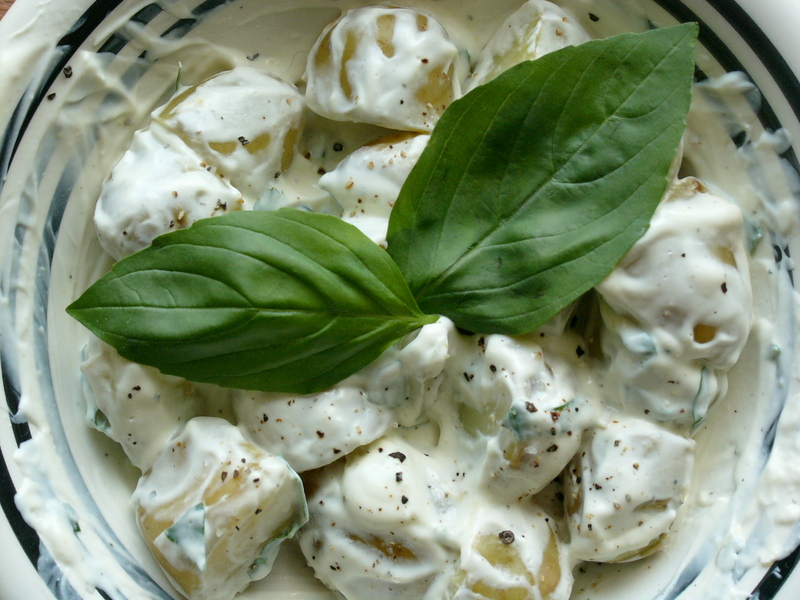 While the potatoes are cooking, mix together the cream cheese, fromage frais, lemon zest and juice. 3. Gently rinse the basil leaves, put them in a pile one on top of the other then roll them up in a cigar shape and cut across to get ribbons of basil. Mix into the dressing. 4. Tip the hot potatoes into the dressing, stir and season to taste. This entry was posted in Cookery writers, Gluten-free, One pot, River Cafe Easy, Rose Gray and Ruth Rogers, Salad recipes, Spring vegetable recipes, Summer recipes, The Cook Shelf, Vegetarian recipes, Wheat-free and tagged Gordon Ramsay, new potato recipes, potato salad recipes, River Cafe Easy recipes. Bookmark the permalink.